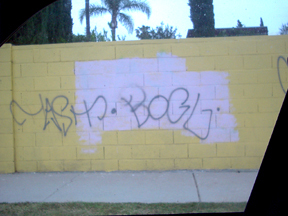 Taggers have trashed our city with Graffiti. 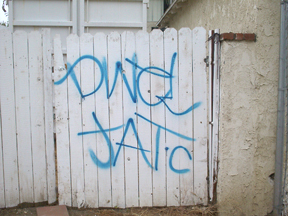 Taggers go on to become gang members who later commit more serious crimes. Painting over grafitti keeps us busy and does not solve the problem. 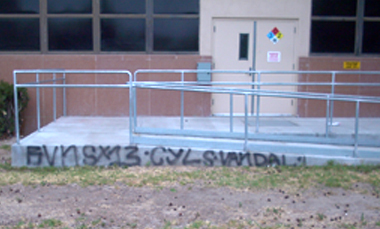 Taggers can be easily identified by the monickers they leave which are practically their signatures. The City Council should call for the establishment of a permanent Police Tagging Investigation Task Force, stiffer fines and penalties, and all illegal alien taggers, convicted or not, should be promptly turned over to the INS for deportation. Well, well. 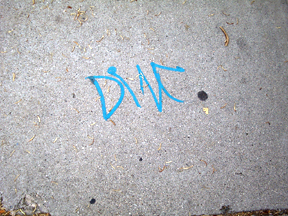 So ex-cop Councilman Dennis Zine called for an increase in rewards as a part of efforts to curb graffiti. Well I say, bull because a few months ago I turned in to the LAPD the make of a car, the license and description of two people vandalizing a truck. I was told nothing could be done unless the person whose vehicle was being vandalized complained. God bless the Los Angeles Police Department for the job they do, but who does Councilman Zine think is going to take care of this problem? Never mind the reward.